Instagram for the past couple of months, if not nearing 3-4 I have found incredibly hard to grow. It has been frustrating at times and left me not posting anything for days. But over the past 6 weeks I've learned a few tips that have helped me gain quickly again. By no means am I up there gaining thousands of followers a day, but I feel I'm out of the 'gain 5 lose 4' game that seemed to be going on. Instagram is notoriously hard to grow as so many have cottoned on to making money from being an 'influencer'. Large followings are all well and good, but if you're not getting regular interaction it's all a bit in vain. Join a pod. A pod is basically a group of like-minded people, who you can post your latest pictures to in a private message. They will all comment on that picture, and you do the same back. It gives you a little loyal following and boosts you up the algorithm. Try Instagram Instants. There are lots of Facebook groups that will post threads at certain points in the day, you can link your latest photo, and everyone in that thread will 'like' your photo. This can produce hundreds of likes for you. Thus again, boosting you up feeds. My favourite group so far is this one. Interact with others. Search relevant hashtags and interact with other photos you enjoy, follow more people, and comment on more photos. It's a way to put your name out there and the more it's out, the more people will see you & are likely to click back onto your own account and follow. Use hashtags. 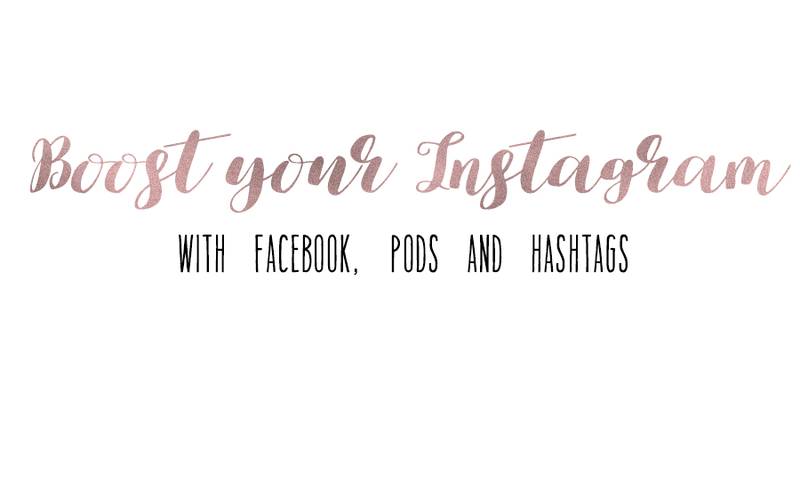 Hashtags that are relevant to your photo are important, if your photo is very popular quickly which is can be by using the above methods. You'll find yourself in the top 9 photos of that hashtag. This is really good for getting new followers and lots of comments. I can instantly tell when I've made the top 9 of a popular # because I get an influx of interaction. I can easily gain 100 followers in an hour from being part of that top nine. So hashtags for me are the most vital. I'm sharing below some of my favourite for different niches. Try a theme. Trust me it's hard sticking to a theme, but I am a little neat freak and I like all my photos to look quite uniform, that doesn't mean you have to do the same. But I noticed that when I gain followers since I've created a theme on my IG, a lot of my followers have stayed, I'm guessing it's because they like the photos and the style I use. If your photos are totally random, then chances are what someone follows you and enjoys seeing one day they might not see again for a while - thus unfollowing you. I do hope this has helped and I think following these few simple tips, a long with using relevant hashtags, you will quickly see a change in both your interaction and following. Great ideas and pods are so helpful! I need to up my hashtag game though! Some great ideas here, I do love a hashtag or 30! Some really brilliant hashtag suggestions here, great post! Great suggestions there - I need all of the help I can get here! The lists of hashtags are really useful - thank you. I struggle with a theme really - some people do it really well but I'm not quite sure how. I feel like I wouldn't use photos just because they didn't 'fit' the theme and that seems a shame.